Sachin & Babi beaded coconut earrings. Lionel beaded clip-on earrings by Dannijo. Oxidized silver-plated hardware and chain. Acrylic rose posts with mixed beading. Approx. 4"L drop. Clip-on backs. 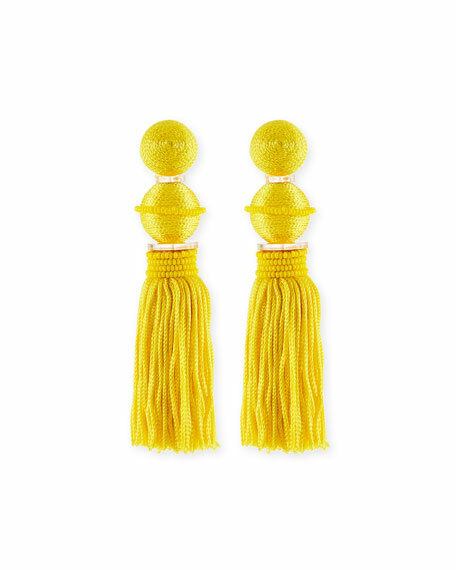 Oscar de la Renta statement earrings. Woven nylon ball and tassel with glass beads. Approx. 4.5"L. Clip-on backs. Imported. Oscar de la Renta beaded heart earrings. Brass hardware with heart outline drop. Plastic crystals and glass seed beads. Approx. 3.8"L drop. Clip-on backs. Imported. Beaded link clip earrings by Oscar de la Renta. Brass hardware and clip-on backs. Glass seed bead posts and links. Five interlocking link dangles. Imported.